When your beloved dog enters his twilight years he may start needing a little extra care and comfort. He may have joint problems and you may start to notice it takes him just a little bit longer each morning to get up off his dog bed. He may have one of our standard nest dog beds and he may start to struggle to get in now when he used to do flying leaps into the nest the previous year. We now have an easy access nest that has been designed to incorporate a dropped down section at the front so old arthritic hounds can just step into the dog bed and snuggle down for the night. These beds are great, the dogs are still able to curl up inside the bed and also can still rest their heads on the side of the nest so they don’t miss out on anything going on around them. They fully exclude draughts from open doors and are totally insulated from the floor as there is a removable futon type cushion inside that stays fresh and never goes flat or lumpy. The Nest Dog Bed comes fitted with a luxury fleece cushion cover. These are removable and very easy to wash at 40 degrees. They are also very soft and keep your dog lovely and cosy in the cold winter months. 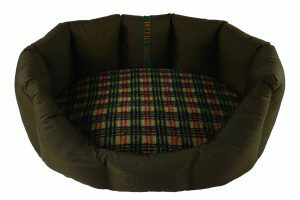 Easy Access Tuffies Nest Dog Bed in Durasoft Chocolate with a Tweed Luxury Fleece Nest Cushion Cover. Our other option for older dogs is our Mattress Dog Bed. These come in a variety of sizes, so whether you have a Tiny Pomeranian or a Giant Great Dane we have a size that would be perfect for any dog. We even offer a bespoke service and can make beds to fit the rear of your truck, a crate or a funky shaped kennel. Our Mattress Dog Beds along with all our other dog beds contain a substantial futon mattress based on polyester hollow fibre. This mattress supports your dog’s joints to perfection and gives 100% insulation from any cold floor. The futon channels mean that nothing moves, or lumps and the thick insulation remains intact year in year out. Inside our dog beds nothing moves, clumps or flattens. The mattress beds are great for older dogs as they are approximately 4.5″ thick so the dog can simply step on to the bed. The dog is then free to sprawl out across the bed. The Mattress Dog Beds are great additions in summer months as the dog can feel cool whilst lounging. Then when the winter months come around you can add one of our optional luxury fleece covers for more comfort and warmth. 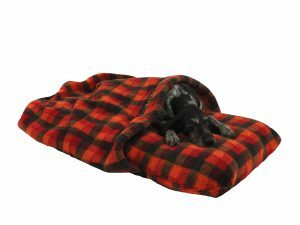 Or indeed if he really likes to snuggle up we can offer you our optional Tunnel Dog Bed Cover. These have been a great hit with Dalmatians, Vizslas, Whippets and Daschunds as they always seem to like to be under the covers. The Tunnel Cover is also made from our Luxury Fleece material, especially commissioned by Tuffies at the fleece manufacturers. When you pop one of our waterproof dog beds inside the cover, it closes like a pillow-case and stays in place no matter how much your dog moves around. It is a question we are quite often asked here at Tuffies. Our cat has urinated on the dog bed, how do we get rid of the smell! The problem with cat urine is that it only really gives a bad smell when it is left unnot.. There is no greater feeling then when spring is moving in to summer. For humans we start to throw open our front doors the house gets cleaned from top to bottom you can keep up with the washing and life seems happy. Dogs..